A 3/2 fullsuit is the thinnest fullsuit available for surfing. Actually there are 2mm fullsuits but these fall more under that spring wetsuits since they are still used in warmer waters. Like the name tells you a 3/2 full wetsuit – fullsuit covers your whole body except your head, hands and feet. The numbers 3/2 represent the thickness of neoprene used in this wetsuit. 3 stands for 3 millimeters and 2 stands for 2 millimeters. This means that a 3/2 wetsuit is made from neoprene of two different thicknesses, the thicker one is usually used on the body and legs and the thinner is used on the arms and crotch area. The reason for this is improved flexibility of the wetsuit. Thicker neoprene keeps your core warmer while thinner neoprene allows for more flexibility where you need it. How to check for wetsuit thickness?The numbers 3/2 are written on the sleeve just above the wrist or just below the shoulder. 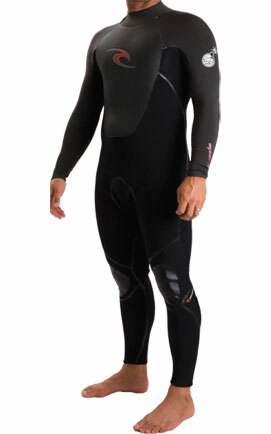 A 3/2 wetsuit is already made for colder water. If you combine it with wetsuit boots you can use it anywhere down to 57F (14C). This is not a firm number though; there are many things that influence at what temperature a wetsuit can be used so check our wetsuit thickness and water temperature guide to find out more. Sealed seams –look for liquid taped, liquid sealed (there are different names for this) seam. These seams are sealed with liquid rubber and are therefore “100%” waterproof. A wetsuit with sealed seams will be warmer than one without them. 3/2 wetsuit boomb! Also, great info. Would one of these be appropriate for water in the 70-77 degrees range? I enjoy swimming/snorkeling in [sub]tropical waters, in which that is the normal minimum temperature during winter.